So why do people want to attract purple martins? Why would anyone want to go out of his way to supply housing for these birds. Well, here's just a few reasons. They're beautiful and delightful creatures, literally filling the air in summer, singing their hearts out and eating large quantities of insects that could otherwise be pestering us. They're very friendly birds, actually enjoying being in the company of humans. In fact, once settled in, they 'expect' to see humans around their nesting sites. When they return every spring it actually makes a person feel as though they've accomplished something by supplying them a home and having them use it for nesting. In fact, after a year or two, one will actually start looking for their return. My own personal belief is that spring doesn't begin until the martins return. They're very soothing to watch. Sitting out in the evenings and watching their aerial acrobatics is a joy that cannot be described here in words. It must be witnessed in person. And there is no age limit. Many a fond memory will be retained by all who simply sit and watch them. So what are some of the things needed to attract purple martins. Let's take a look. Martins like space to spread their wings. The air over open fields, pastures and wide open lawns are some of their favorite hangouts. They can often be seen floating on early morning thermals, dipping and diving, snatching insects from the air, their low guttural songs announcing to others to come and partake in the feast they have found. Now, if you live in a town with lots of houses around and don't think that martins will come, think again. In a town near where I live, one man has as many as 24 gourds, 12 feet off the ground and they are full of purple martins every year. In fact, it's a place of business where people are coming and going all day and the martins don't even blink an eye. They just go about their business plucking insects out of the air over the tree and roof tops. The key to his success, the location of his site. First, keep this one thing in mind when establishing and locating any purple martin site. Nesting Purple Martins don't like trees or bushes close to their nesting site. These trees or bushes could harbor predators, and if they feel unsafe in any way, they just won't stay. If you plan to attempt to attract martins to any area, the site should have a lot of landing room. Martins like to swoop into their nests, and if there are any tall trees or other hindering obstructions close by, it is going to be very difficult for the site to attract them. A 'common rule' is that the 'housing should be placed at a distance away equal to the height of the offending object' be it a tree or a building. The swooping nature of martins makes this a must and if you've ever watched martins come into an established colony, then you'd understand. You'll hear numbers like 40 feet as a minimum, but I feel that number is a little close in many situations and if you're dealing with trees that are 60' or 70' tall, then the 40' foot number is definitely too close. If the rule above is followed, then you have a better chance of attracting them. Each situation has to be evaluated on its own merits. And secondly, don't place the site too far away from human housing. Try to keep it within 60' - 100' of 'your' house. I know this is contrary to the normal rules of nature and the rule stated above, but martins like to have human activity going on when they are nesting. They actually want to see their landlord. Apparently, through generations of imprinting, they feel the commotion around the site helps keep predators away. Martins drink and bathe on the wing. Therefore, your chances to attract them improve if there is clean, open water somewhat near the site, within a half mile if possible. If there isn't then don't give up. Martins have been known to fly up to 2 miles for a drink, although the closer the water is, the more attractive the site is going to be. And if you do happen to get some martins to move in, don't worry about the young, they get all the moisture they need from the insects that are fed to them. No, martins do not drink from bird baths. Martins eat insects, lots of insects. Among them are dragonflies, horseflies, wasps, beetles, moths and grasshoppers. They will even catch an occasional housefly that happens to stray a little too high. This is another reason for starting a martin colony. They will help keep the insect population somewhat under control. No, martins do not eat from bird feeders. However; one of the major misconceptions that people have about purple martins is that they eat thousands of mosquitoes every day. Unfortunately, this is not the case. If you take a minute or two to read Homes for Birds/Purple Martins, you'll find that they're not the mosquito devastators that some might have you believe. If you are interested in controlling mosquitoes, then you'll have to find another means. Just like any other creature of nature, martins are opportunistic eaters and will take what ever food is available at the time, and according to the studies done on the subject, mosquitoes are not near the top of that list. Studies showed that mosquitoes were less than 2 % of the martins' diet and if you stop to think about it, mosquitoes come out about dark, just about the same time martins go to roost, so the two just don't cross paths. Now this is not intended to dissuade your beliefs about martins. I'm simply presenting the facts taken from studies done on the subject. This in no way detracts from the fact that these birds are still a joy to have around. If they weren't, I wouldn't be here trying to persuade you to try and attract them. Martins like to nest in colonies and over the years, have come to depend on man almost exclusively for their housing. (Generational Imprinting). They will need someone to supply them with and maintain a nesting site. This means someone to keep the site in good repair, apply proper predator protection devices where required, clean it out at the end of each nesting season and keep other pests away from the site so they can enjoy the raising of their young in relative peace and safety. The type of structure to be supplied for the martins is at the discretion or personal preference of the landlord and often this decision may be made due to monetary availability, however, before spending any money on housing, the potential landlord should educate themselves as much as possible on the different types of housing available and the pros and cons of each. If you decide you'd like to erect a purple martin site, do it in such a way that you'll enjoy what you're doing. Just be forewarned. You 'will' be bothered by pests and predators, you 'will' have to get at the nests to clean them out and you 'should' perform nest checks. And, of course, there is always some general maintenance that will need to be done from time to time. If you have to climb ladders or work with difficult housing to do your maintenance, then it won't be any fun and therefore, you won't enjoy yourself. Regardless of what type of housing you decide on, it should be easily accessible so you can perform the maintenance, thus making it an enjoyable hobby. You'll want to have housing that is easily accessible by lowering on a pole. This can be either a pulley system or a telescoping pole system depending on the type of housing you have. This makes maintenance very quick and easy, something that is desirable when the martins are in the site. Going out of your way to properly erect your site to begin with will make life a lot easier and more enjoyable for you down the road. Regardless of housing selection, when using the vertical access method, I recommend using good, sturdy ropes and pulleys because when you have all the extra weight of the martins and their nesting materials in the nests, telescoping poles become difficult to work with. For someone who is slight in stature, this could become a problem. Also, NEVER use housing that TILTS on a pole to gain access to the house. This could damage the eggs or harm the young. It's a common feeling amongst a lot of 'old timers' and many new landlords that they are afraid to do nest checks for fear of scaring their hard won tenants away. It's felt that, if they bother the birds, they will abandon their nests and not come back. After all, they worked very hard to get these birds to come and stay, why would they want to disturb them and have them leave. It is a proven fact that nesting purple martins are not afraid of human intervention and in fact, records show they do 'much better' and will raise and fledge more nestlings if regular nest checks are done. Contrary to many beliefs, purple martins do not seem to mind if their nests are 'temporarily' disturbed by humans once they are established. This doesn't mean overdoing it, but once every 4 or 5 days will tell the landlord how things are going in the nest, and they will be able to spot any trouble in time to do something about it. And take the time to keep records. From a nest check done every 4 or 5 days, the landlord can; check how nest building is progressing, approximate when the first egg was laid, check for predator and/or parasite problems, keep an eye on the young and generally learn more about the birds as they progress through their reproduction cycle. After all, isn't that one of the reasons you wanted purple martins anyway! As with anything in nature, martins have quite a few natural enemies. Coopers and Sharp Shinned Hawks may get one every now and then. This is natural and is natures way, everything has to eat. Owls can create a lot of problems and in fact, if the proper guards aren't installed, they can wipe out an entire colony in one or two nights. Grounded critters such as cats, raccoons, squirrels or snakes should not be a threat to a 'properly erected' and maintained site that has the 'appropriate predator guards' properly installed and in place. One major problem martins have is competition for nesting sites from other birds. The two major pests you will have problems with are the English House Sparrow and the European Starling. These non-native birds will take over nesting sites and fiercely fend off the martins, especially if they are young martin arrivals that are not yet established in the site. Both birds are transplants here in the U.S. and have become so numerous that they are now considered pest species, especially to martin and bluebird landlords. I happen to enjoy birds and I feed them year round, but when it comes to my martin sites, I give no quarter to any bird that tries to take over a nest. Depending on the bird species, offering friendly native species alternative housing to relocate should be practiced. Likewise, capture and destroying the non-native species should be practiced. Mites, lice and blowflies are common nest parasites and can become a problem if the site is not properly maintained. These problems can only be identified if nest checks are done. If they do become a problem, there are a number of things you can do to rid the site of them. See my expanded thoughts and comments on controlling pests. Probably one of the most asked questions about purple martin housing is, "How high should my housing be?" This is a matter of preference for the landlord to be and the type of housing being offered. Martins will nest at just about any height from 10' all the way up to 20'. I have personally seen them nesting in a gourd that was hung on a 4' page wire fence beside a horse pen. Look at your own situation and evaluate it from there. If you have a tall pole with a crank for lifting a heavy wooden house, then it doesn't matter. The crank is going to be doing all the work for you so height is not a problem. If however, you have an aluminum house setting on top of a telescoping pole, you are not going to want it too high, because you'll have to raise and lower the house by hand, and if it gets full of nesting material and birds, this can become quite a chore. If you have gourd racks and pulley systems like I do, then the effort of raising and lowering the racks is not that much because of the pulley system. You can select how high you want your gourds to be, cut the pole off at that height and go from there. If you have an ideal site with no trees in sight, then you could start at 10' or 12'. That way, you will have them right close to the ground where they can be inspected easily and also enjoyed more. The higher you have them, the more difficult it is to work your housing for inspections. Also, the higher the housing is, the more susceptible it is to high winds. For sites that are open, this can be a problem at just about any time, and bent or broken poles are often the results. If because of your site location you have to start high, say 18' to 20', once you get them established, you can lower the housing by cutting about 3' off the pole each year until you get it down to where it is more manageable. One other thing. All of my examples given are for housing that is manageable, meaning being able to raise and lower the housing for inspections, pest control and maintenance. If you have housing that is just mounted to the top of a tall wooden or metal pole and it doesn't have these capabilities, I strongly suggest that the time and effort be taken to change it out. Hauling out a ladder each time you need to get into your martin house is a chore and makes the hobby less enjoyable. Also more dangerous. For years it has been debated between purple martin lovers about what type of structure should be put up for martins? Houses...Gourds? Should they be made from Wood...Aluminum...Plastic? Some swear that tenant houses are the only way to go, and among them, they debate whether they should be made from wood or aluminum or plastic. Others say that gourds work wonderfully. I say it totally depends on your own personal feelings or requirements. 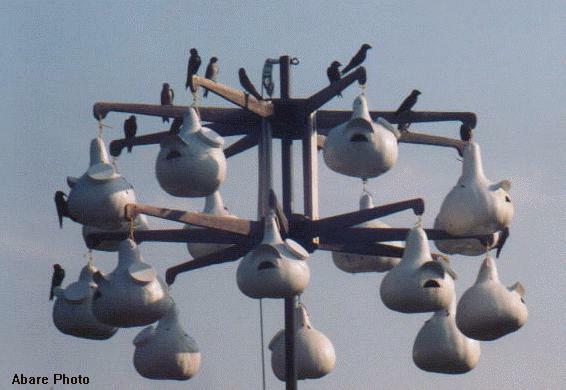 Let's explore this purple martin housing debate a little deeper. Purple martins are very gregarious birds, meaning they like to hang out with a lot of their own kind. And, not only are they friendly towards each other, but they're also very friendly towards man. (Generational Imprinting). In fact, they actually prefer nesting around the dwellings of humans, relying on the humans to build them suitable places to nest, and to keep them in good repair. Since they like to nest in colonies, one of the best ways to help them do this is to supply them tenant type houses to nest in. (Houses with a lot of rooms in them, at least 8 - 12 to start). But, often these houses, because of their size and weight can be heavy and cumbersome and difficult to maneuver up and down poles, sometimes requiring cranks and winches. Some are hard mounted and don't move at all, requiring a ladder to perform maintenance. And still others tilt with the pole for cleaning out. Because pest birds such as starlings and sparrows like to nest in martin housing and because of their persistence, the house will have to be lowered to clean out the nests of these unwanted pests, often every day. If you have a tilting house, the eggs or young could easily break or fall out of the nest. Therefore, a pole that allows the vertical raising and lowering of the house is preferred. Let me also note, if you use wooden poles to mount your housing, make sure the proper predator guards are in place. Cats or any other critters that climb are a definite deterrent to martins nesting in your house and without guards preventing this, they will shimmy up the pole and make short work of your colony. There are a number of different commercial houses on the market that are made out of aluminum, are light and work rather well on a telescoping pole that allows the house to be raised and lowered. But be prepared, they are not cheap and people will often think twice before purchasing one. Some of the better quality houses available today are going to be expensive, but I'm one that says "you get what you pay for'. Might cost now, but it will last for many years to come, making it 'cheaper in the long run'. Buying the cheaper models only adds to the manufacturer's bottom line because you have to come back in shorter time to buy another one. So what's better. Wood... Aluminum...Plastic? I have a woodshop and I build my martin houses. I make them from Western Cedar, a very light and weather resistant wood. It's excellent for building bird houses of all kinds. Because the wood is porous, it has very good insulating properties from heat or cold, and the natural resins in the wood make it a good wood to use out in the elements. I have bird houses that I built 10 years ago from it that are still going strong showing very little wear. My own personal suggestion, if your going to build your own martin house, or bird house of any kind for that matter, don't build it out of any kind of wood not suited for use out in the elements. You'll just be building it again in 5 or 6 years. Unless you know what you are doing, be sure and fully investigate lumber that has been specifically treated for outdoor use when building any type of structure intended to house any kind of live creature. These lumbers have special chemicals imbedded in the wood to make it last longer in the elements and although not all, some of those chemicals are poisonous to many living creatures, including humans. Before using this kind of wood, ask questions from an expert to make sure that you know what you're dealing with. Aluminum. Since I work in the engineering field, I know that aluminum can dissipate heat very well. I also know that it can absorb heat from direct sun just as well. Although I have not done any thermal tests as far as birdhouses are concerned, the experts say that it works very well. My own personal experience is that martins hesitate to nest in them.. One of the problems found with them is their small 6 x 6 x 6 inch compartments make for very crowded living conditions. This isn't very much room for a bird that is 8" long. The better ones have the ability to remove a middle panel and make the compartments 6 x 6 x 12 inches or better yet, are designed from the start for the larger compartments. This gives the birds much more room to raise their broods and also offers much more protection if a flying predator just happens by. I've seen statements from aluminum housing manufacturers that state starlings shy away from the bright insides of aluminum houses however; that's not what I've personally witnessed. I've also seen sparrows literally infest an aluminum martin house. The small compartments are just the right size, just the right height and dry. My own personal conclusion is this. Starlings and sparrows will invade ANY type of martin housing regardless of what it is if it fits their needs. Wood, aluminum, plastic, gourds, all are susceptible to these pests, and once they take up residence, the only way to get rid of them is to trap and destroy them or shoot them. They will not give up a nesting cavity once they occupy it. Another point about aluminum, the cost. One of these aluminum houses can be rather pricey. Aluminum as a material is very expensive, but will last out in the elements for a very long time, therefore; it's a great material for outside use such as martin houses. If you plan to buy one, the only question here is, can you afford one of the better ones? Remember one thing. Aluminum martin houses are made and sold by manufacturers to make money. Therefore, they are engineered to be manufactured for the least investment possible so the manufacturer can make as much profit as possible. Although things are slowly changing, in some cases, I don't believe the martins' best interests are fully taken into consideration. If they were, the 6 x 6 x 6 inch compartments would be enlarged to 6 x 6 x 12 so that the birds would have more room to raise their broods. Plastic martin houses are another option available however; my own first hand experience is that any that are available on the market today just aren't very well suited for purple martin housing. They may look pretty, but the material is much too light weight and if a Great Horned or Barred Owl wanted in, then he would simply rip the front face off the house and get in. From conversations I've been in, these manufacturers have no intention of changing their houses to make them stronger, better or safer for the martins. If you're interested in plastic, then I say, make sure it is a quality house with the capabilities to change to the larger compartments or you'll only end up regretting it later. And make sure you have access into the front of the house by removable front doors. I promise, you'll need it. Now, let's look at gourds. This is another form of housing that is widely used throughout the martins' range. They're light, they're cheap, they're just the right size and if done right, very easy to care for. If for some reason one becomes unusable, you simply replace it. Like houses, they should be painted white to reflect the heat from the sun. This also helps attract the martins and it'll also make the gourds last longer. Gourds can be presented to the martins in many different ways. One outdated method is to string them on a wire stretched between two poles, but this method makes maintenance very difficult and the martins uneasy because the wires attach to poles, making access by predators much easier. They can also be put on a metal pole with cross arms, however, many of these setups are not easily accessible. Another approach to hang gourds on racks of different kinds. Some use old rake tines, some use wagon wheels. Below is a rack that I designed because I didn't like any of the other arrangements. This one raises and lowers very easily for nest checks and maintenance and trust me, the martins love it. Martins love places to roost and preen and this design has plenty. I've added a couple of these to my site and now have both wooden martin houses and these gourd rack systems in my yard. I just offered them as an alternative to the houses and the martins took right to them. Gourds were used long before houses were invented and they worked just fine then. And just like any other outdoor item you might have, they will require occasional maintenance, and/or replacing. Although very hard on the outside, their walls are porous and therefore, do not transfer heat very well. Along with natural gourds, there are also now plastic gourds. Two versions that are out are the upright and the horizontal. There are a number of suppliers for the upright and one so far for the horizontal. Both versions come in a large 10" plus size and both report good numbers and popularity. However, there are a few of the very small 6" plastics that shouldn't be sold for martin housing and in fact, they should be removed from the market place because they are so dangerous for martins to nest in. Any avian predator that comes by can simply reach in and remove the contents and fly off with it. This is why I feel there should be a standard for martin housing and if commercial housing doesn't come up to those standards, then it should be removed from the shelves. When should a Purple Martin house be put up? This is probably one of the hardest questions to answer for any pending purple martin landlord. 'Housing' here is defined as any form of structure intended for Purple Martins to nest in. Wood, Plastic, Aluminum or Gourds. You've made your choice as to the type of housing you want to use, spring is here, your anxious and ready to put it up. The major question here is, When? There are actually three different factors to consider in determining the answer to this question. Factor One: Is your site 'established'? In other words, did you put housing up last year and did martins nest in it? If so, then you can consider your site established. This means that, assuming nothing has happened to the birds that nested there last year and they nested successfully, then they will return to your site this year. Therefore, all you need to know is, when do the scouts usually arrive in your area? This is generally a given time period plus/minus a couple of weeks. For instance if I look at the map HERE, I can tell that the first martins generally arrive in my area here in Northern Alabama around the 1st of March. Since my site is 'established', I would want to have my housing 'up' and 'open' on or before that date. That way, the scouts for my site, (the first martins to return to any area), will have a place to land and assume nesting cavities. Factor Two: Is your site 'new'? In this case, obviously, you have new housing and it has yet to be put up. Again, look at the map and find the time for the approximate arrival of scouts in your area, add 3 or 4 weeks to that date and then put your housing up. Some believe that attracting martins to new housing is different. Although there are exceptions to all rules, more than likely you're not going to get any mature martins to nest in your new site the first year. Purple Martins have a very strong 'site tenacity', meaning they will return to the same site they successfully nested in previously. It's this one fact that keeps purple martin colonies going year after year. Therefore, the birds you're looking to attract will more than likely be 'second year' birds (SY), or birds that were hatched the previous year. They have not yet nested anywhere before and therefore, will be looking for places in which to set up house keeping. Some of the young birds will return to the sites where they were hatched, but that's a very small percentage. Most of the offspring spread out to other sites the following year and for the most part, these are the birds you're looking to attract. And don't get discouraged. Depending on where you live, some of these second year birds could be returning as many as 10 weeks behind the scouts. OK, so when do these birds arrive in my area? SY birds usually begin returning on an average of about 4 weeks after the mature birds have arrived, and then continue to arrive for about another 4 - 6 weeks depending on where you live. Therefore, after seeing the map, I know that the scouts usually start arriving here around Mar 1st. If you were starting a new site, you need to add 4 weeks and put your housing up around April 1st. However; I feel there is a third factor. I'm one that feels that some older and more mature birds will change sites if they consider a new site to be better than the one they were in the previous year. With that thought, I would open a new house on the same dates that established colonies did. Then, if some mature birds decided that my site was more superior than the old one, then they would move to my site. I've witnessed this in person and as of late, a lot of landlords that had to move and needed to start over also found out that by raising their site on the scout arrival dates, that mature birds will come to new sites. Sometimes you can get lucky and not have to wait those extra 4 to 6 weeks. Also, usually not all birds are able to mate and nest the previous year. These birds will return as mature birds and will be looking for a place to nest. Since they were unsuccessful the previous year, they just may be looking for a new site and they site just may be yours.